This is a very special pup for a very special home. 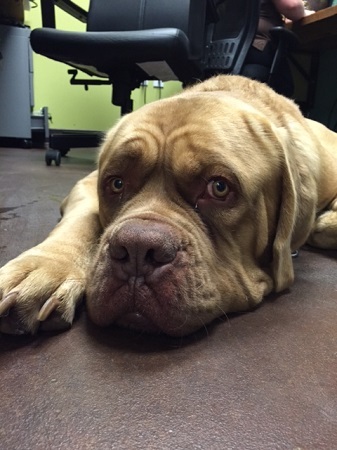 Nils is a 1.5 year French Mastiff, Dogue de Bordeaux in need of a home. He has a huge head and a huge heart! He does great with other dogs and while his size makes him a beast, he has a more gentle play style. He is a ham for attention, loves people and being part of the family. He will require some basic training but he is potty trained. He is curious with kitties, but with a dog-savvy feline friend and consistent training he should do well. The main concern for this guy is his back. He had a severe injury when he was younger where he was paralyzed in his rear legs. He recovered but still has residual back pain and rear limb weakness as a result. This will require long-tern management so he can regain some strength and support in the rear end. Assistance with getting him acupuncture and laser therapy will be included with his adoption, but he will also need medication and supplements. He shouldn’t be in a place where he needs to do lots of stairs regularly and some carpeting would be ideal. He will make a wonderful companion and is a really easy and relaxed boy! He is good with kids 8 and up and would enjoy a home with another canine companion! Would you be his perfect family? Fill out the adoption application so we can schedule a meet and greet. He is fixed, vaccinated and microchipped. His adoption fee is $180. He is currently living in foster care.